We want to press 12’’ records with own material, limited to 200 copies. We also want a proper artwork to accompany the record. 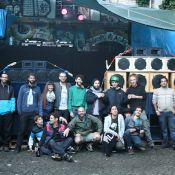 We are Dubtopia, a collective from Bern, Switzerland. the core consist of about a dozen people – each with his or her strengths and talents. We have producers, DJs, Sound ingeneers, Organizers, bookers, artists and people who just help out for the love of it. We all share the fascination for soundsystem culture, Dub, roots, UK Steppers, and Dubstep. We exist since 4 years when we did out first soundsystem session in the local squat. Since then we grew as a group and as friends but also our ambitions. We think, that it’s timeto showcase our tunes and provide a plattform for up and coming producers in the bass world. The initial idea of doing a record label came from the various good reactions of the audience when playing own dubplates at our sessions. What happens with the Money and where does it go? If you support us you support also small enterprises and artists. To press the record we need a proper mastering – as we cut our dubplates since day dot at ’transition studios’ in london we will be doing it at their cutting house. it’s a long standing cutting house having a big role in pushing the underground sounds, especially dubstep. we still have to decide which pressing plant to engage but be sure, that we will be going for a rather small pressing plant instead of a major pressing plant. Distribution will be ’do-it-yourself’ we have a pretty good network and therefor we believe that we will be able to bring the records out to the people. But we do want to involve small record stores such as Plattfon (basel), Layup (bern) or rewind-forward (bristol). Our friend Severin H. who draws and screen prints our dubtopia posters will be doing the artwork for us. You support a local artist and a local, small screen printing enterprise. When will the record be available? As soon as we receive the funds the process will beginn. Our aim is 7 months after we receive the funds. We want to keep the label going with regular releases coming out. But always keeping quality control over the output. We want to be able to finance a release with our previous one. If this doesn’t work out we still have the possibility to cross-subsidisate our label with our soundsystem sessions. This project ended successfully on 13/6/2015 15:00! 2x Vinyl + 1x Testpress + 2x2 Guestlist for any Dubtopia + screen printed Poster + a detailed feedback for one of your tracks. 1x Vinyl + 1 Acetate Dubplate with a tune of a phrex and Cutkachi each + Guestlist for you and your friends for a Dubtopia Session. 1x Vinyl + a personal dedication printed on all 200 copies + Guestlist for you and your friends for a Dubtopia Session. 1x Vinyl + a personal dedication printed on all 200 copies + phrex comes to play at your night (no fees, just travel expenses) + Guestlist for you and your friends for a Dubtopia Session.